One other car was parked near the end of the plowed road when we arrived. Some fresh snowshoe tracks before the bridge but they didn’t help much, so I had to start snowshoeing right off the bat. 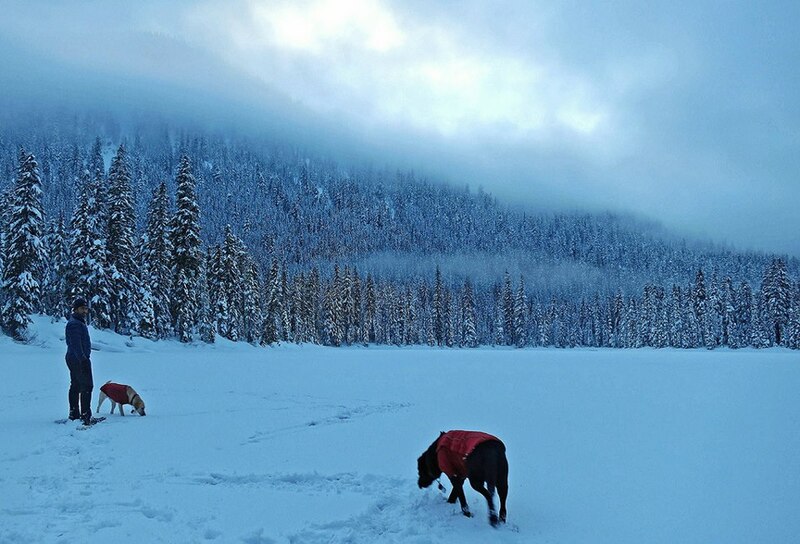 The dogs and I caught up to the two snowshoers at the trailhead about one mile from the parking lot. They worked hard to break trail for us! What I thought was a quick and easy stroll to the lake turned out to be a lot of work plowing through the snow and it took longer than expected. Since we got a late start, we arrived at the lake about an hour before sunset. On the way back I opted for the service road even though it was a mile longer, but it shaved off 1.5 hours from the trip. It looked like the two lady snowshoers we past and the dogs and I were the first ones on this trail since the area got hit with about two feet of fresh snow. So unless there had been more snowfall since we were there, our tracks should still be visible and hopefully could help with trail breaking.